Steve Lonegan is a competent conservative candidate who has had the misfortune of running for statewide office in a liberal state. After losing to Chris Christie in the GOP primary for governor in 2009, Lonegan went up against Cory Booker for a Senate seat in a race that no Republican candidate probably could have won and predictably, he lost 55-44. Now, Lonegan is running for the House in New Jersey’s 3rd Congressional District. Currently, squishy Republican Jon Runyan represents the district, but he’s retiring. That’s opening things up for a primary battle between Lonegan and liberal Republican Tom MacArthur who has been endorsed by the anti-grassroots NRCC and the sleazy Ocean County GOP, which coincidentally received a $25,000 donation from MacArthur. Right Wing News is supporting Lonegan in that battle because he’s the most conservative Republican running who can win the district — and he can win. Lonegan has tremendous name recognition in the district because of his runs at statewide office, it’s a R+1 district and he took 54% of that district in his race against Booker. 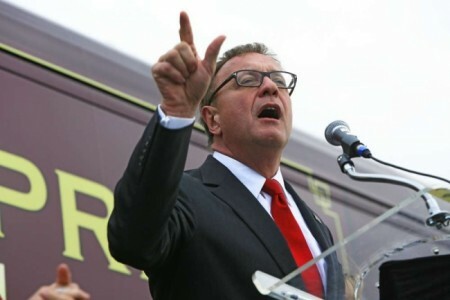 That’s why Right Wing News endorses Steve Lonegan for Congress in New Jersey’s 3rd Congressional District.